Are you planning your Osaka itinerary and wondering what the best day trips from Osaka are? Let us help you plan & book your Osaka day trips today! Osaka in Japan, is one of the most beautiful port cities and is a commercial center on the Japanese island of Honshu. It is a perfect place to base yourself at and to discover the surrounding regions when you venture out on your day trips from Osaka. Your adventure only starts here! On your day trips out of Osaka; you can get amongst beautiful temples, shrines, and much much more. You can walk with the deer on your Nara Deer Park Osaka day trip; you can check out the amazing city of Kyoto, and Himeji castle will steal your heart away! 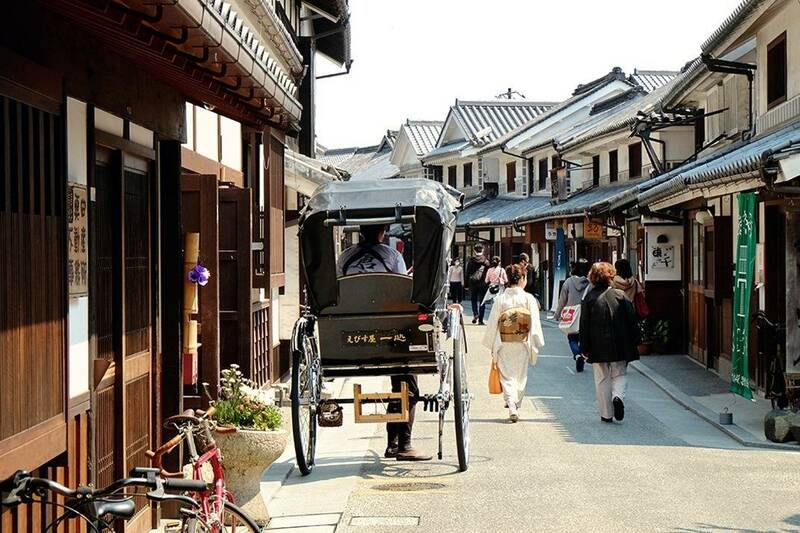 Kurashiki old town’s cobblestone streets will teleport you to Japan’s past and your trip to Miyajima island… (well this is my favourite) will create unforgettable memories! What is even better is that all of these ideas are great as day trips from Osaka by train. It is really easy to access the trains in Osaka, which means that your trips will be easy to plan. Find below a list of the top day trips from Osaka. 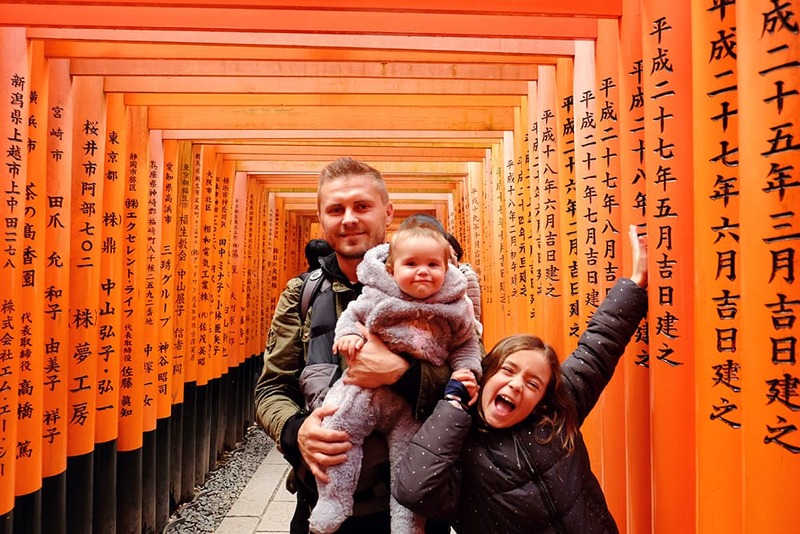 Kyoto is our favorite city that we have visited on our trip to Japan! It might come as no surprise that Kyoto is at the top of our list of side trips from Osaka. This city was home for the emperors for over a millennium, from 794 until 1868. You will find a number of spectacular gardens, Buddhist temples, Shinto shrines, imperial palaces and traditional wooden houses. There are so many amazing places that we recommend for you to see apart from the above three. If you have a bit more time spare on your day trip to Kyoto, we would also urge you to see Kinkaku-ji temple ( the Golden Pagoda), Ginkaku-ji temple (the Silver Pagoda), Philosopher’s Path (only in Cherry Blossom season) and the famous Kyoto Streets Ninen-zaka and Sannen-zaka! Whilst you can easily do a one day trip from Osaka to Kyoto, we do highly recommend that consider staying in Kyoto for a few nights. 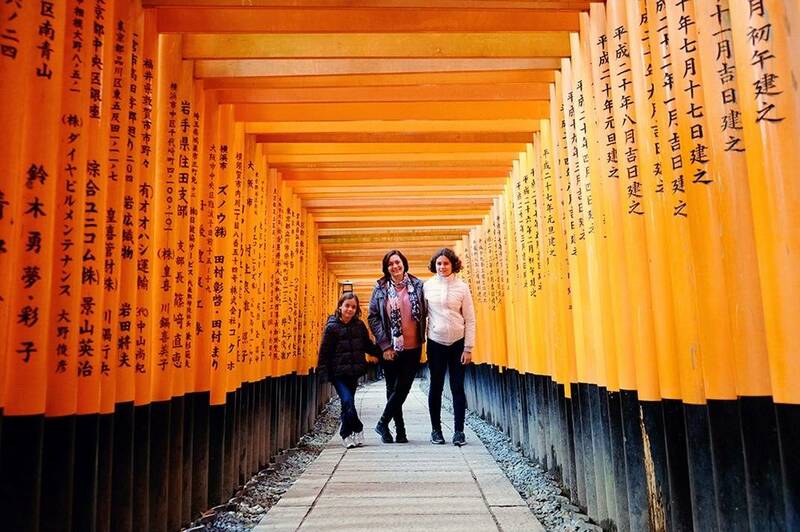 You can easily get to Kyoto on your own (find relevant info below), but for those of you who like to sit back and enjoy the ease of an organized tour, we can highly recommend this particular Kyoto Day Tour from Osaka – Kyoto Temples & Shrines Day Tour from Osaka. 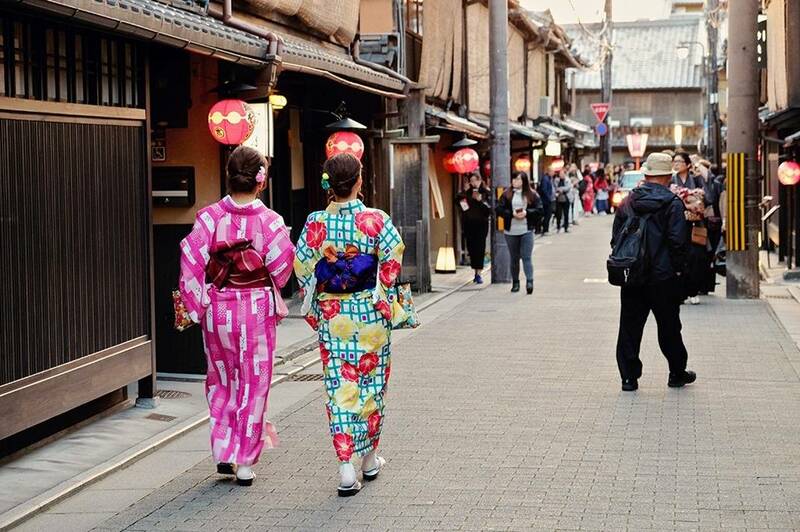 Click here to check prices for this very popular Kyoto tour from Osaka! JR Kyoto Line will take you from Osaka Station to Kyoto Station in 29 minutes. Tip: We highly recommend for you to purchase the JR Rail Pass prior to coming for your holiday to Japan. Click here to purchase your pass now! For the latest timetables, please follow the link Osaka to Kyoto by train. Tip: If you are travelling with a JR Rail Pass (which we highly recommend!!) you might want to take an Osaka to Kyoto bullet train. This shinkansen train will take you from Shin-Osaka Station to Kyoto Station in just 15 minutes. Worth it if you have a JR pass and that way you can see more of Kyoto! Welcome to the 8th century capital of Japan. Nara is located in the south-central Honshu and only under an hour away from Osaka! We heard that here at Nara, the deer walk amongst the temples and mingle with the visitors. Nara Deer Park is awesome!! Without a doubt, I think that this was the best Osaka side trip for kids. Katie and Lily were more than stoked to be able to feed all the deer. You can buy a packet of deer biscuits for only 150 Yen. Note that you might have to buy a few packets because there is a lot of deer in the park and they all look super cute. In the heart of the Nara Deer Park, you will find one of the most significant temples of Japan, the famous Todai-Ji temple. This temple is home to the magnificent Daibutsu, Todai-ji’s 15 meter high bronze Buddha statue. This is one of the biggest Buddha statues that I have ever seen! There are plenty of things to do in Nara, so you won't have any problem filling up your day here. Nara is the perfect 1 day trip from Osaka, whilst some prefer to stay a night or two, we really felt like 1 day was enough to absorb the park and its main attractions. 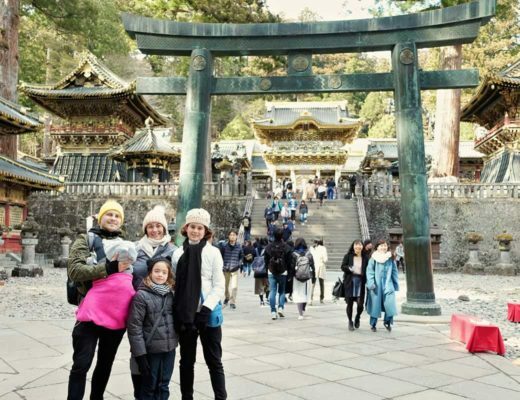 You can easily get to Nara on your own (find relevant info below), but for those of you who like to sit back and enjoy the ease of an organized tour for your Osaka to Nara day trip; we can highly recommend the Arashiyama & Nara Todai-ji Day Tour from Osaka. JR Yamatoji Line will take you from Osaka Station to JR Nara Station in 50 minutes. We highly recommend for you to purchase the JR Rail Pass prior to coming for your holiday to Japan. Click here to purchase your pass now! For the latest timetables, please follow the link Osaka to Nara by train. OK, I know that this is a day trip in Osaka itself, but it will require a full day of exploring. It is a definite must do! Universal Studios Japan is not only for the kids. Even us, big kids, are allowed to have some fun too. There is so much fun to choose from. The park is divided into eight main sections. There is New York, San Francisco, Amity Village and Hollywood to check out. There is a Jurassic Park world with a pretty awesome ride … Waterworld with the unique show to see and the Universal Wonderland as well. However, what we came here to see was the one-of-a-kind —-> The Wizarding World of Harry Potter!! 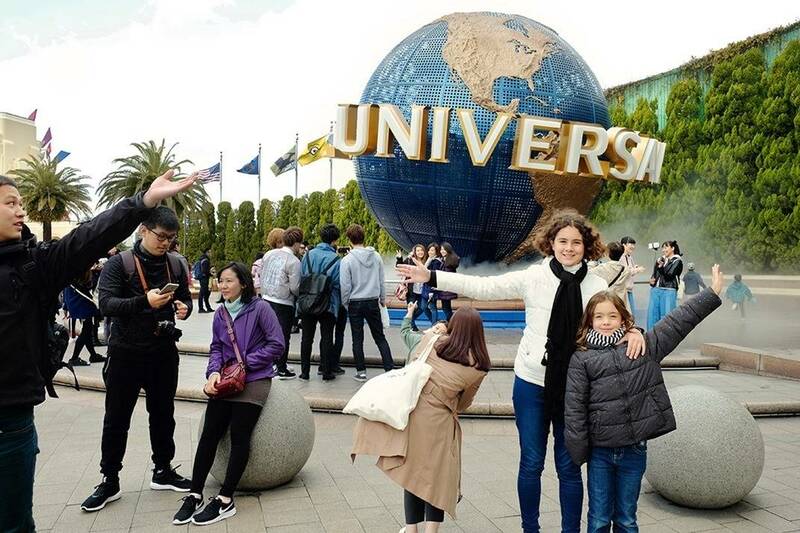 We surprised Katie and Lily with a day trip to Universal Studios in Osaka and we have to say that we were all super impressed. It was simply spectacular. The Harry Potter World is just brilliant. You can find everything Harry Potter there. From Butterbeer, to wands, to cloaks for each of the houses. You can enter the Hogwarts Castle, where you can even find the paintings … speaking to each other. Katie proclaimed that the ride inside the castle was ‘ the best ride of ALL TIME!!!' – Pretty impressive huh. We had lunch at the Three Broomsticks and the atmosphere was just amazing. The park is also the home of Sesame Street and Hello Kitty. We saw loads of dressed up Hollywood characters wonder up and down the streets. We watched a pretty crazy fun show at Waterworld. Man, the atmosphere at the show was incredible. You simply cannot miss out on this day trip! This park can get extremely busy with waiting lines of over 1.5 hours (during Japan school holidays), so we highly recommend that you pre-purchase your tickets online in order to skip as much of the queues as you can. Purchase your Ticket: Click here to purchase your 1-day e-ticket. This is just the standard ticket that allows you entry into the park, but you will get to skip the line-ups, so worth being pre-organized! 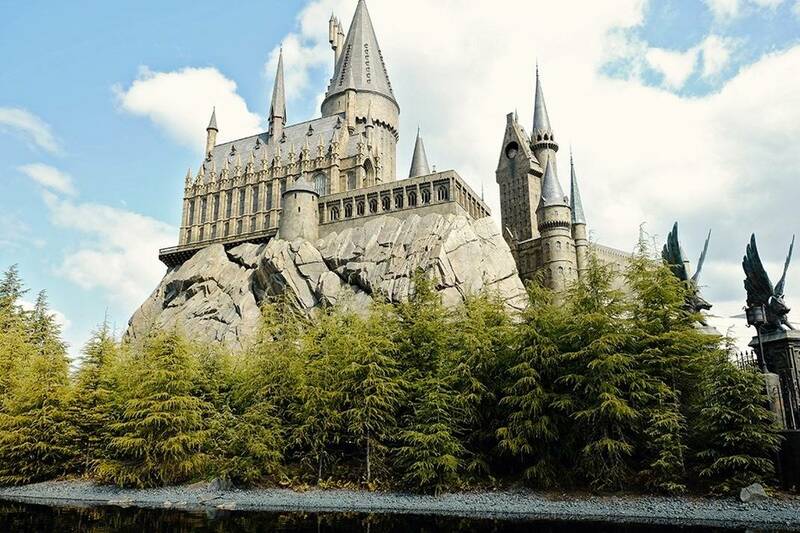 Grab a VIP Wristband (Harry Potter World Fans): If you are mainly interested in the Harry Potter World, we highly suggest you add on a USJ VIP Wristband. This wristband is magic, and it allows you fast-tracked entry into the HP world, which means you can be the first in line for the rides! Click here to purchase your VIP wristband! Purchase a 7 Ride Express Pass: If you want to enjoy rides throughout the whole USJ park, forget about the wristband and grab an express pass instead. The express pass will allow you to skip the lines on 7 of the most popular rides in the park. With typically waiting lines of 1+ hours, this pass will save you loads of time, which means you can enjoy more rides and get more value out of your day. Grab your USJ 7 Ride Express Pass here. From Osaka Station, it will take you only 12 minutes. For the latest timetables, please follow the link Osaka to USJ by train. 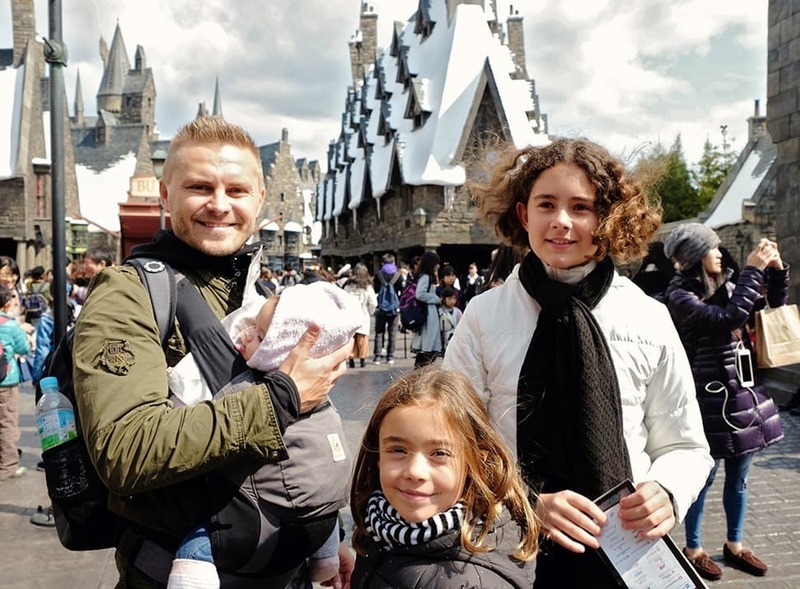 For more information on the Wizarding World of Harry Potter at Universal Studios Japan, click to read a great post here. Himeji-jo is a UNESCO World Heritage Site and a spectacular example of a 17th-century Japanese castle. The castle is also called Shirasagijo or the White Heron Castle. 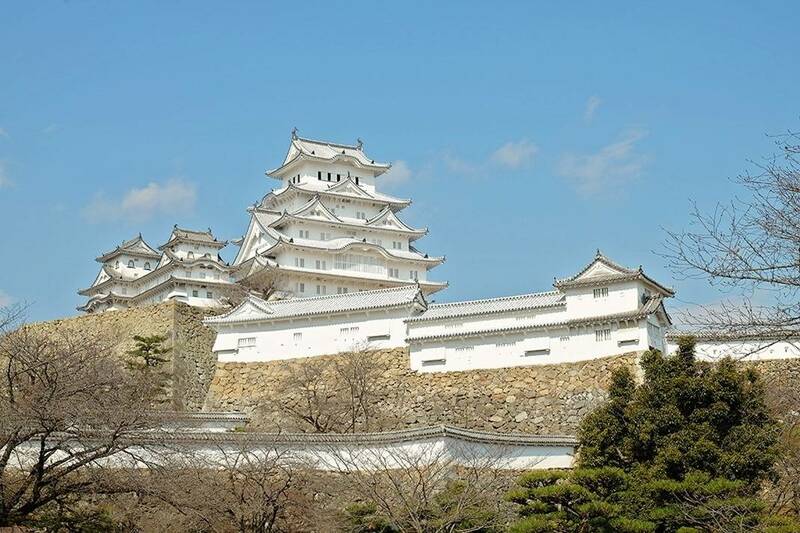 This white walled architectural marvel is the best-preserved castle in all of Japan. Well, that says it all… a definite must see as one of the top day trips outside of Osaka. Make sure to check out the famous Koko-en garden next to the castle whilst you are there. 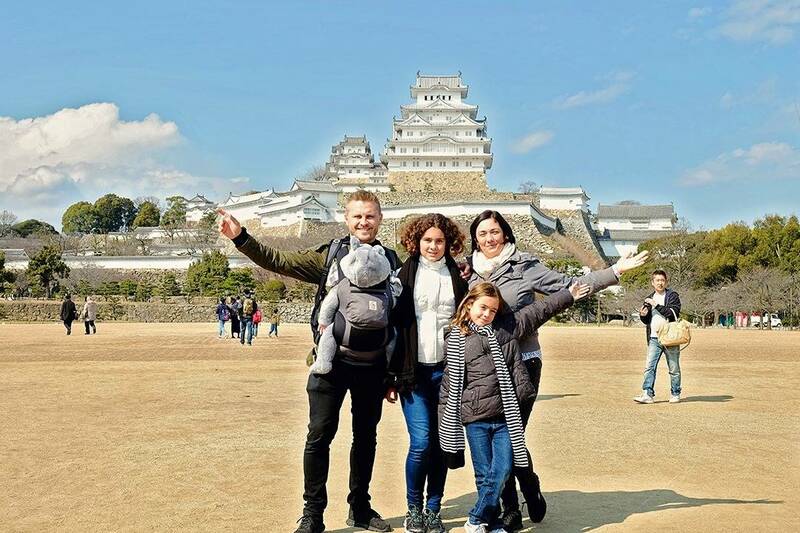 Your Himeji Castle day trip will very most likely be a very busy day, but if you have time to explore a bit more, we would recommend that you make your way to Mt. Shosha. You can take a local bus to the end of the line, where you can go on a little adventure at the Mt. Shosha ropeway. The bus station is close to the Himeji castle. Here is a great post with even more ideas on things to do in Himeji. 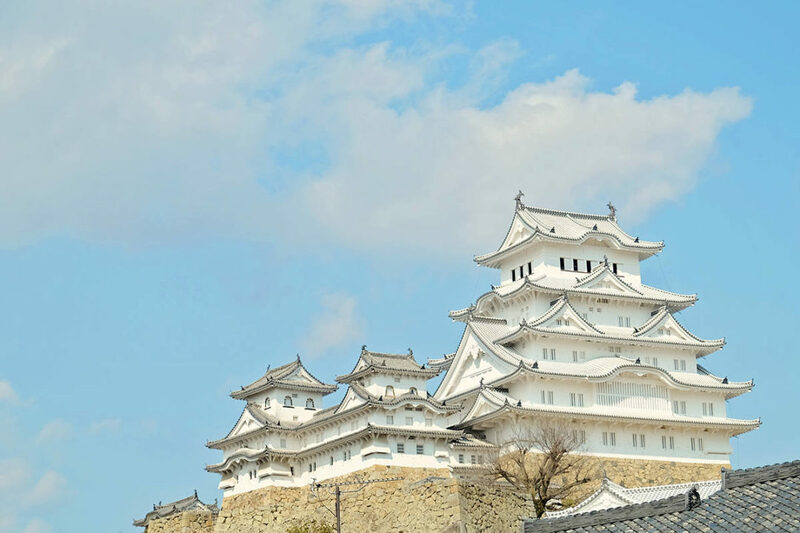 You can easily get to Himeji on your own (find relevant info below), but for those of you who like to sit back and enjoy the ease of an organized tour for your Osaka to Himeji day trip; we can highly recommend the Himeji Castle and Akashi Kaikyo Bridge from Osaka day tour! Click here to check prices for this very popular day tour! Shinkansen from Shin-Osaka Station and it will take you only 29 minutes. For the latest timetables, please follow the link Osaka to Himeji by train. 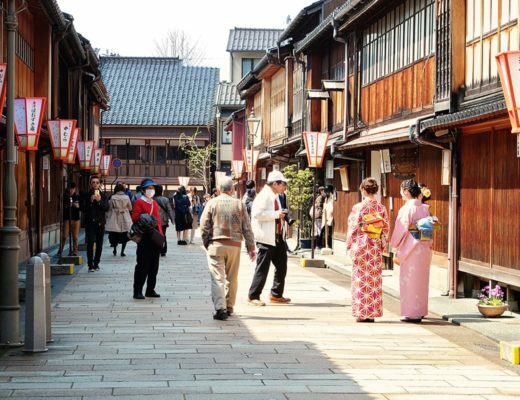 Kurashiki is a little delight for those of us travellers in need of a bit of culture and in search of the old Japan. This is a perfect place for that! 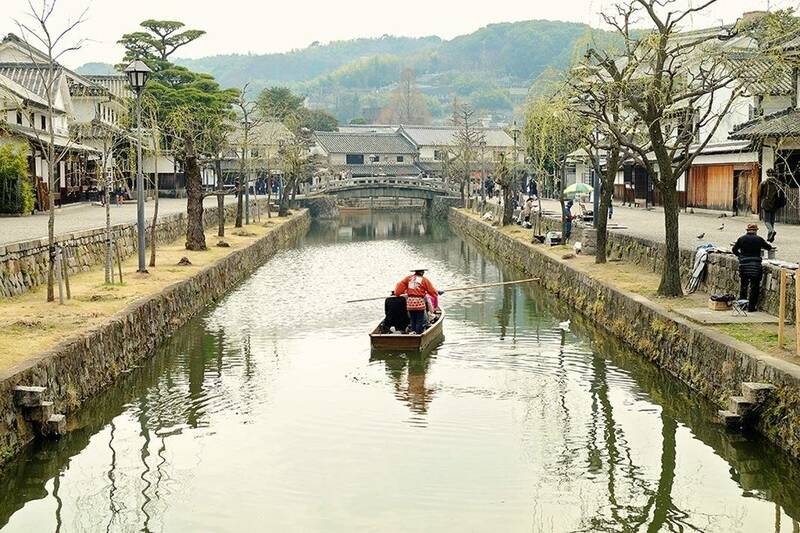 Kurashiki is a great addition to the Osaka side trips list, as many travellers are unaware of this city, and whilst it might be busy there, you very most likely will find more Japanese than tourists walking the streets of the Old Town. Kurashiki dates back to the Edo Period (1603-1867) and has a well-preserved canal that runs through the centre of the old town. The canal is one of the main attractions of the town, alongside Ohara museum and beautiful old wooden houses lining the streets. In the Cherry Blossom season, this place looks magical! Katie and Lily were especially happy to check out the rainforest cat cafe located at the beginning of the Kurashiki scenic streets. We don’t have those back in Australia, so this was a bit more of a treat for them! In turn, we loved to wander around the magical old town whilst snapping some unique pics. Click here to read more about this beautiful city. Sanyo Shinkansen will take you from Shin-Osaka Station to Okayama Station in 50-70 minutes depending on the model of a train you catch. For the latest timetables, please follow the link Osaka to Kurashiki by train. This beautiful island has been called an Island of Gods on the Seto Inland Sea and for a reason! It is one of the most scenic and spectacular places in Japan. The Great Torii gate shine like a beacon in the sea, welcoming you to the island and the Itsukushima Shrine (World Heritage site). Have a quick watch of our video below to get an idea of what the island is like. Beautiful streets of the old Japan open up around and up to the magnificent Mt. Misen, where you can go on a ropeway to the top for a panoramic view. What is not to love about this island… History and romance walk hand in hand here and a feeling of peace and bliss relaxes you to the core! Well, at least it did for me. Unofficially, Miyajima is called a deer island of Japan. Deer walk here freely amongst the locals and tourists alike. Our kids were super stoked to see so many animals on our travels, but I think meeting deer in such a beautiful setting was just that little bit extra special. 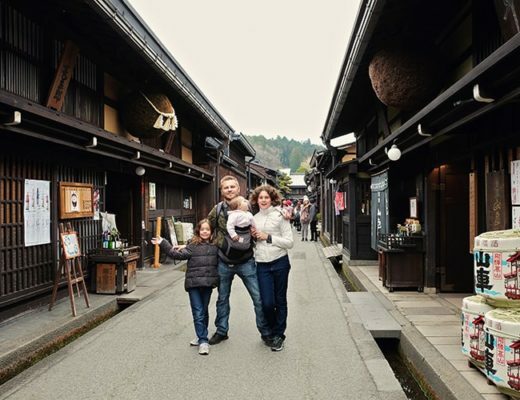 Whilst you can easily manage to do a day trip from Osaka to Miyajima Island in one day (if you get up early and expect to get back late); we do recommend you stay a night if you can. 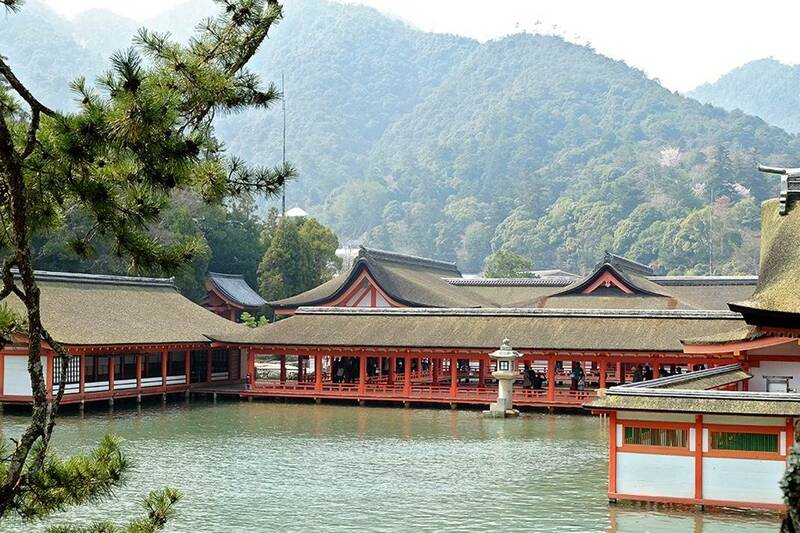 You can easily get to Miyajima on your own (find relevant info below), but for those of you who like to sit back and enjoy the ease of an organized tour, we can highly recommend the combined Hiroshima & Miyajima Group Day Trip. The best way to get from Osaka to Miyajima is by the Sakura Line. Sakura Line will take you from Shin-Osaka Station to Hiroshima Station in 1 hour and 32 minutes. Local train from 9th Station from Hiroshima to Miyajima-guchi will take 30 minutes. We highly recommend for you to purchase the JR Rail Pass prior to coming for your holiday to Japan. If you have a JR Pass, not only can you get to Miyajima for ‘free' on it, but you can always catch the ferry for ‘free' as well! Click here to purchase your pass now! For the latest timetables, please follow the link Miyajima from Osaka by train. Everyone knows about Hiroshima and its history and destruction after the fall of an atomic bomb. So it is no surprise that the main attraction to this city is indeed the Hiroshima Peace Memorial, Park & Museum. 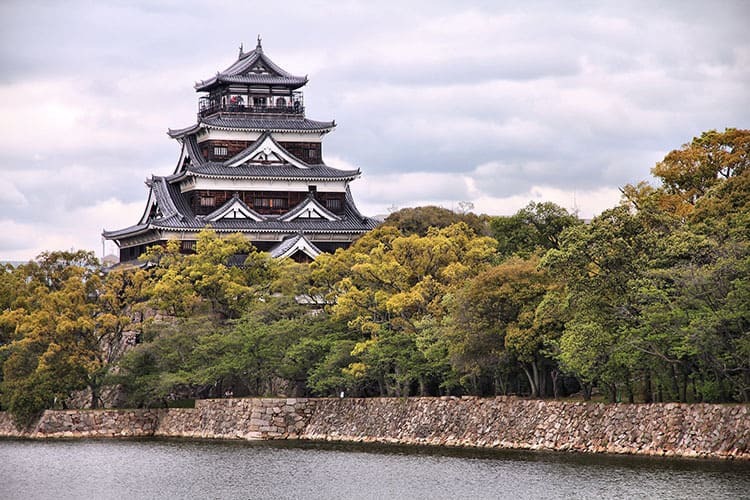 Other very popular things to do in Hiroshima include visiting the unique wooden Hiroshima Castle, strolling around the beautiful Shukkei-en Japanese gardens & simply eating and shopping till you drop! 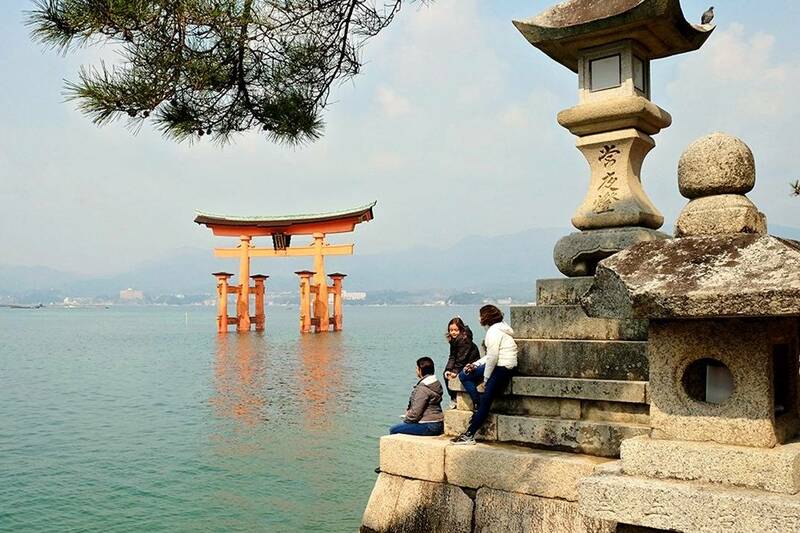 You can easily get to Hiroshima on your own (find relevant info below), but for those of you who like to sit back and enjoy the ease of choosing from the Hiroshima tours from Osaka; we can highly recommend the combined Hiroshima & Miyajima Group Day Trip. The best way to get from Osaka to Hiroshima is by the Sakura Line. For the latest timetables, please follow the link: Hiroshima from Osaka by train. In October 2017, a typhoon caused damage to the railway tracks between Hashimoto and Gokurakubashi. 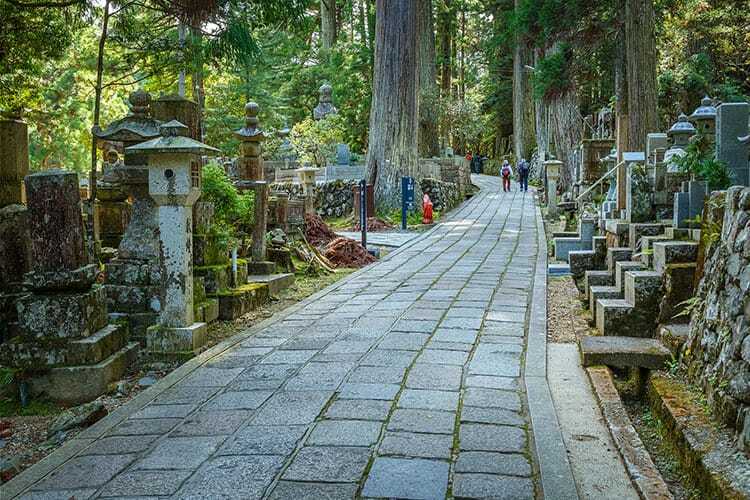 As a result, visitors to Koyasan can currently take the train only as far as Hashimoto where they have to transfer to a substitute bus to Koyasan. As a result, the one-way journey between Osaka and Koyasan takes about 2.5 hours. So if you want to enjoy a trip to Mt. Koya, we highly recommend you invest in a day tour option. The Mt. Koya Day Trek Tour is very popular! 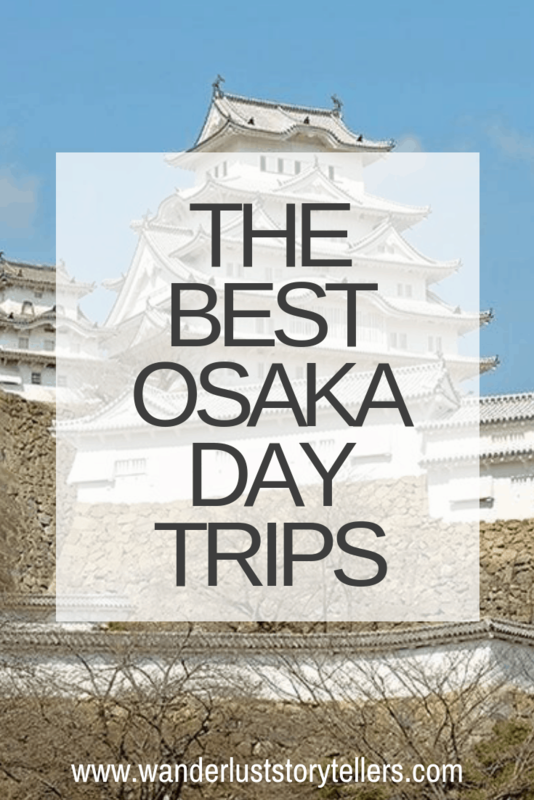 Other Top Osaka Day Tours to Check Out! Wondering where to stay in Osaka? 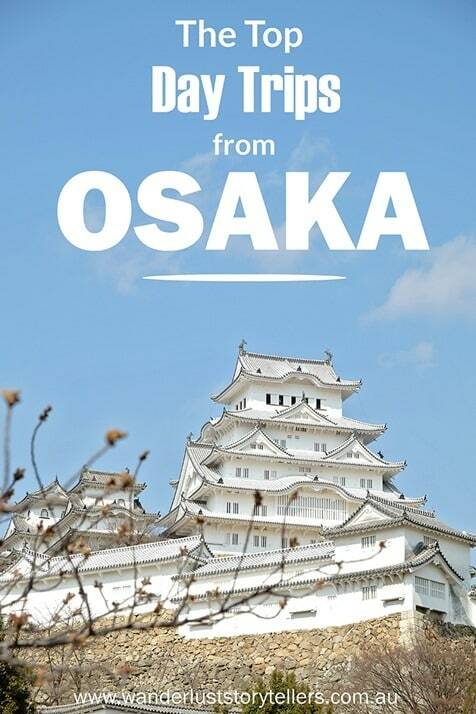 You Could Travel has a great post about the different areas in Osaka. She outlines the benefits of each area; as well as lists recommended accommodation choices for you to pick from. We love going on day trips. I guess every day that we are on our trips seems to be a day trip to somewhere, always packed to the brim with activities and destinations. And that’s the way we like it. Because why not?! If you are in a beautiful country or your bucket list destination, make the most of it. Take all the time that you have and explore as much as it is possible. Because, who knows if you ever will have a chance to come back again. 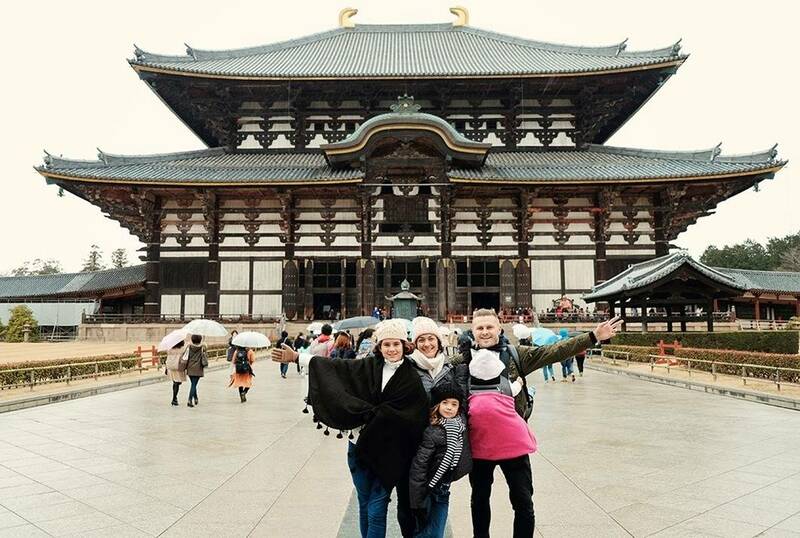 We hope you enjoy your day trips from Osaka as much as we did! Peace and safe travels to you all!! Which of the destinations of our ”Osaka day trips” did you like the most? Will you be adding a side trip from Osaka or one of the tours from Osaka to your Japan itinerary? I just spent a few days in Osaka and saw a lot of the things mentioned here. In fact I just played my video of Nara park and all the deer as all as a couple other nearby things. We’re traveling to Japan next week and i have book marked all the day trips you’ve mentioned above. One quick question , if i don’t want to buy the JR pass and just want to purchase the ticket as and when we go, how soon/early do i have to book the tickets? And where? Would really really appreciate a response! I have been researching travel to Japan and it has been quite overwhelming! Your blog is going to be my guide! Hi Kripa, you can often just turn up 30-45 min early to the train station and grab a ticket then 🙂 Also, you can always catch the next train, you might just have to stand if there aren’t any seats. We never really pre-booked tickets, we just made sure to turn up a bit earlier for the train so we had time to queue up and grab tickets. I think we had to wait once or twice for the train after in order to get seats on the 4+ hour trains, so just enjoyed a coffee or lunch whilst we waited. Hello, andre and families. My daughter (12 yrs) and I are planning an 8 day trip to Osaka. We would like to do all the one day tours you recommended (except Hiroshima). How do I get hold of a tour company to organise six tours in advance, we love culture and nature. Btw, which hotels do you recommend? Our budget is around USD140 per night. Thank you so much in advance! Hi Angela, I would just suggest booking the tours through the links we have provided here 😉 As the tours will look slightly different with different companies. Klook & Viator are probably our favorite tour booking platforms. 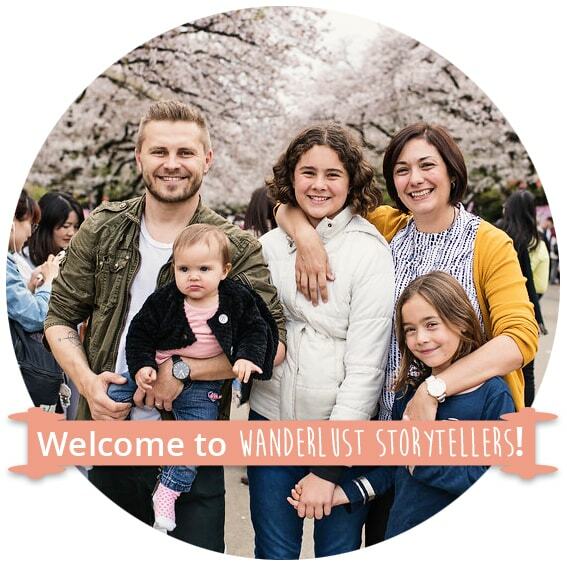 As to hotels, we stayed in an Airbnb which was very affordable – it was cherry blossom season when we went and the prices of hotels were through the roof!! If your budget is limited, check out Airbnb for accommodation choices. Thanks for a great post! I’m going to Japan in October and plan to do many of the day tours that you suggest. Really helpful advices with the stations! 🙂 My plan is to go to Nara, Kyoto and Hiroshima. Which part in Osaka is the best to stay in for easy access to the stations? I’m going to buy a JR pass. Thank you for your answer and helpful post!! Hi there, all areas of Osaka is great for train access 😉 Just check out a map before you book to make sure the train stations are close by. We stayed in one of the ‘less’ popular areas in Osaka as it was cheaper, but within a short train ride we could still reach all the major spots 🙂 For easy reference, most travelers typically stay in Namba in Osaka. Great tips and can’t wait to get to some of these places. Would you recommend staying in Osaka or Kyoto? Hi, I personally prefer Kyoto, but both cities have brilliant train systems that will allow you to zoom to everywhere and anywhere you want.